It is a sad fact in media: people of color are hardly represented. Here at Art Lords, however, people of color are considerably better represented. Here are some of our favorites. Feredica Porpora Anastasio is a master of her craft. In this piece her model is displayed with such vigorous emotion, such a humanity, that the image jumps out from the screen and makes the viewer wonder what they did or said to illicit that look from our subject. Beautiful. Where blind anti-immigrant folks might see women in hijab or burqa as all the same, a closer eye finds a beautiful diversity. Here Algerian artist Brinis Yaccine does a beautiful sketch of a woman in hijab. 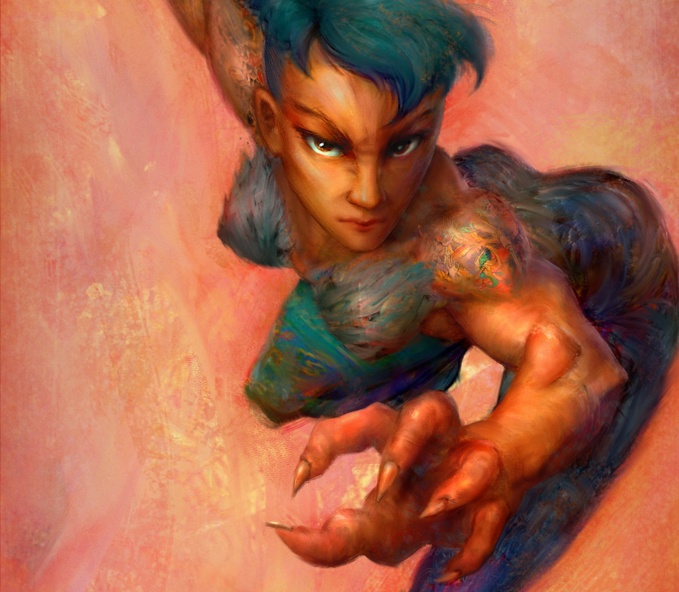 Gwendolyn the Storyless Warrior Chick is a beautiful digital painting where our subject is both wonderfully composed and incredibly powerful. The Maori are a fierce people native to New Zealand, and Lina Porres’s piece highlights that intensity. Qureshi’s piece, “Wise Old Man,” is a fresh take on the grayscale portraiture that is common in digital media right now. The eyes especially, imply a character that I would love to see come to life in film or comics. Trill Robin by Lionel Cornelius Jr is a fantastic piece. I know they just restarted the DC universe not too long ago, but this version of Robin would be incredible to see alongside the caped crusader. Marc Sampson’s portrait is fascinating, the purple eyes are especially intriguing. This is like Sergent Johnson meets Gears of War. Hell yeah! Ian Bourlin’s “Escape” is a gentle expression of sorrow, with a strange ethereal background that makes us wonder what story this is a part of. I hope you’ve enjoyed this special gallery.